Front, from left: Dani Iwami, Karli Kato, Mari Shigemasa, Wes Mitter, Spencer Miller, Darren Kusumoto, Michele Park, Lili Hamada. Middle: Jill Nakaso, Amy Yoshinaga, Lindsay Uyematsu, Emma Shimizu, Rachel Williams, Lisa Yamashita, Kylie Masumiya, Jade Santos, Taylor Hirata, Alyssa Movchan, Rachel Masai, Aikane Higa. Back: Tracie Hara, Kaitlin Hara, Stephanie Louie, Erica Avila, Lauren Hong, Kaelyn Kawamoto, Erica Sugimoto, Sara Jinkawa, Caroline “CoCo” Miller, Kara Shimasaki, Amanda Braesch. Not pictured: Kai Sato. 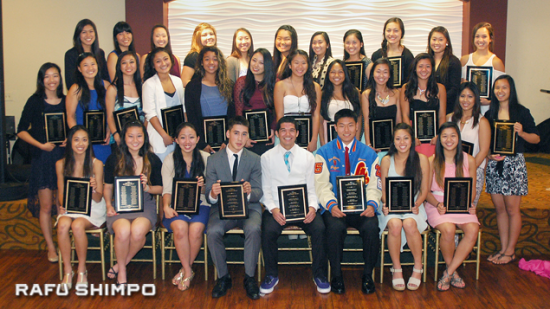 WESTMINSTER — The Orange Coast Sports Association announced its 2013 All-Nikkei Basketball teams on May 15, during a banquet in Westminster. 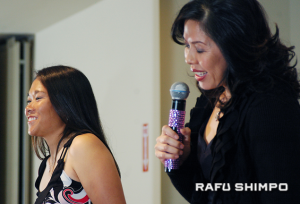 North High School head coach and former Chapman University star Lauren Kamiyama, left, smiles as she is praised by Chapman head coach Carol Jue. Twenty-eight girls and four boys from high schools in Southern California received plaques for their efforts and excellence on the court and in the classroom. OCSA co-director Jesse James recalled the brainstorming, a little more than a dozen years ago, that led to the annual awards, when the OCSA decided to find the seven best Nikkei boys and girls playing high school ball. James said the game has since changed drastically, with Nikkei players routinely starting. Also honored at the event was William Gayler, who was named the OCSA’s Coach of the Year and praised the organization for its commitment and excellence. “The class and the dignity in the way you folks here conduct yourselves makes my life so much easier and so much more enjoyable,” Gayler said. OCSA Director and Orange Coast Optimists President Glenn Tanaka congratulates Darren Kusumoto.